Ellen: Hi, Abby! First things first, your job sounds really cool, and potentially very relevant and connected to your experiences as a runner. Has your background as an experienced Orthopedic Physician Assistant informed your approach to endurance running in any way? Abby: I wish I could say yes, every day. How sweet would it be if by simply knowing the capability of the musculoskeletal anatomy, as well as its limitations, I was able to focus and dial in my running form, gait, and cadence to best accommodate our body's capabilities and minimize injury? That would be pretty amazing. But no, I heel strike, run without even knowing how to make my glutes fire, and never stretch. I however do have an opportunity daily to see what can happen to the bones of an unused body, the joints forced to carry heavy loads but never put through their paces because their person's fitness wouldn't tolerate it. I see everyday the benefits that exercise and a healthy cardiovascular system can do for the body, and that keeps me moving. Ellen: I'm actually very comforted to know that a runner/medical professional like yourself struggles with stretching and glute activation just like I do! Thanks for the validation. But enough about me! Let's move on the question 2... Have you noticed any common mistakes that endurance runners tend to make during races? Abby: I've seen them, and I know them well. Going out too fast, and under fueling/hydrating are standard issue. I find myself recovering from these pitfalls, or mindfully keeping them at bay at every race. I've seen some people grit out amazing races undertrained, but when I feel like I'm dipping into grit as a resource I remind myself that I have done the work and paid my mileage dues and that it is in me physically to complete it. That usually helps. One mistake that I have been able to sidestep is quitting because it feels like it will never end, that there is no way you could go on in your current state. If that is injury or health compromise — YES PLEASE STOP. But being uncomfortable? Keep at it, it will end. I never ran until after I hiked the Appalachian Trail, my first backpacking trip. I learned there that wet socks can last for days and you won't die. I will be hot and sweaty, and you will be hungry, but it will be better soon enough. Out there that maybe 3-4 days before a wet sock or heat reprieve, a race will be done long before that. Ellen: Sounds like your experience with through-hiking and backpacking have giving you a lot of great perspective to take back to endurance running. Perhaps all I need to shake my own current running slump is a few months out in the wilderness. Food for thought. Moving on, what's the most challenging moment you've ever had during a race? Abby: My first 100k was Twisted Branch, an August race. Humidity and heat are my kryptonite. Though I was running well early on soon I fell behind on my hydration, and then way behind. I was moving slower and I had misremembered a cutoff point. I thought my race was about to end and I was doing everything I could to hold back tears. I popped out of the woods and found my dad at a road crossing, and he assumed my tears were from pain and he pleaded for me to stop, but I explained that it was because I was afraid I would be told to stop. He shook his head, clarified that I still had time. I smiled and smiled and headed back into the woods. I ended up not making the real checkpoint anyway. Those emotions, that slowing was a reflection of how much my body had already been exhausted. At 90k my race ended with my resting heart rate well over 100 and my next void more then 12 hours in the future. I learned that time is better spent stopping to pee from over hydrating, then stopping to let the dizziness pass, or to let your heart rate slow because you did not drink enough. Also I have to change my shorts after 50 miles, I get too sweaty, and some things should never chafe. The time I learned that was really challenging too. Ellen: I would have to agree that heat, humidity, and chaffing are kryptonite, and I have only ever had to endure them for a marathon's worth of time on my feet. I struggle to wrap my brain around sustaining these elements for 50 miles plus. You are one tough cookie, Abby! So, let's switch gears a bit. When did you start using technology in running, and did it change your training and racing? Abby: I ran my first few marathons and trail ultras with just a Casio. I used the stop watch function when training to keep track of time at street crossings, bathroom breaks, etc., and would then just do the math to figure out my average pace. When I got my first GPS watch I learned better what paces felt like, but I also learned the sting of headwinds and climbs. I had immediate feedback that if it felt bad, I was doing badly. So I stopped using it so rabidly, looking every half a minute. Looking as the mile chirps its completion lets me know what I have gotten done, and also what more I can do. It has made me a stronger, smarter runner. Also, because I have a narrow temperature comfort range, I keep track of what I wore at certain races. That lets me look back and see a 10k when it was 31 degrees with no wind I wore X and it felt good. It takes some of the guesswork out of it. Now with HR monitoring there is a measure of me working hard vs it feeling hard, and that keeps me honest. Ellen: Nice! It sounds like you use technology in a very practical, resourceful, and healthy way! Kudos on keeping the feedback that you get from it in perspective and not letting the numbers on the watch define the quality of your run. Easier said than done, for sure! Let's talk a little more about your training methodology. Do any training practices or techniques you've tried stick out as having made a real difference in your performance? Mileage: mid-race I think about all the work I have done, when I was tired, when it was hard, when skipping would have been easy, and I realize that it's for this — so use it. 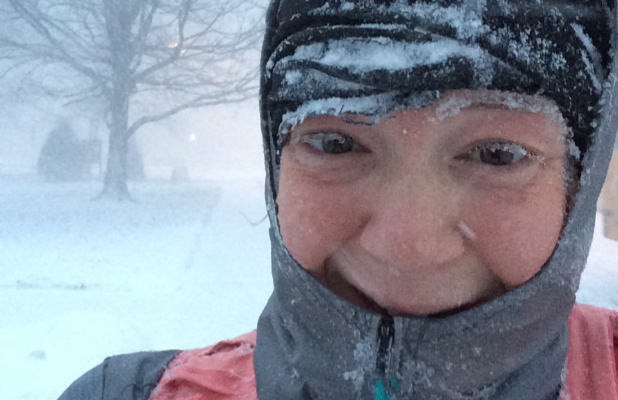 Running in any kind of weather: that way race day you are ready for it all. Speed work: even in the game of endurance racing, speed work has made a big difference in my race results. Even if your muscles are shot, if you know how to turn your legs over you can keep moving forward. Ellen: I don't know about you, but I think that those things and their commonality amongst runners who are training for all kinds of distances is what makes running so beautiful. I really love how it's accessible to everyone and the things you need to do to get better are straightforward and highly accessible as well. But I digress... We want to know more about your personal experience with coaching! You are coached by Daven Oskvig. How did your training and racing change when you started working with your coach? Abby: In so many ways. First of all, he is an amazing runner, and a thoughtful, pragmatic coach. I had never had my mileage coming from the mouth of a human who knew what it took to run far, and to do it well. Before Daven it was always a plan from the internet (which works really well for many people), but I have such an ownership to other's expectations of me that I stick to the workouts he outlines, and he keeps me honest. Week to week he looks at the data and adjusts the training based on what he is seeing. He can tell me, when I don't know, that I have more hills in me, when I can run further, and when I need a break (vs want a break). In the first year I worked with Daven he saw me through my furthest distance (75 miles), and took 12 minutes off of my marathon PR. He has more faith in me then I do, and that helps me when my faith waivers — in training or a race. Ellen: Wow! A 12-minute marathon PR is huge! It sounds like you've really hit the jackpot with finding a coach who understands how to motivate you effectively AND give you sound training advice that translates into real results! That's awesome! Daven coaches you through SportTracks. What can you tell other SportTracks users about the experience of working with your coach on our platform? Abby: Ooo, when I get an email from SportTracks I know that Daven has reviewed my workouts and he has feedback. I can post a workout with my comments and my concerns and thoughts, and it gets plunked right over to him, no need to text or send any extra flags. It's easy for him to see what I have been up to, what he has asked me to do, and what has resulted. Good or bad, we then have something to work with. Because it links with both my Suunto and my Garmin automatically I don't have to do a thing. Ellen: Rad! We're so stoked to know that SportTracks keeps communication between you and your coach easy and streamlined without clogging up other communication platforms such as your email inbox or text message feed. That's exactly what we were going for! :) In your opinion, what is the most valuable thing the sport of endurance running has taught you about yourself? Abby: I am a person who likes to be comfortable. Generally, I will go through great lengths to avoid being uncomfortable. I learned a lot about finding comfort in uncomfortable situations when I hiked the AT. After that, it seemed that I could find a way to be comfortable doing most things. Now to be comfortable running far I just need to run a lot. I am a person who will go through elaborate accommodations to be comfortable. I guess I have learned to be accommodating. Ellen: Well said! I really like how you think of hard work and training as "making accommodations" for making running more comfortable. Yet another excellent perspective! Alright, let's get down to the fun interview questions! Do you have an all-time favorite run, or an iconic bucket list race or route that you dream of doing one day? If so, please tell us about it! Abby: Oh man, I've been working to get my lotto tickets (one year at a time) into the Western States Endurance Run bucket. This February I aim to run the Black Canyons 100k in under 17 hours to get my third ticket into the bin, and will keep my fingers crossed. It's the oldest 100 miler in the United States, and the only 100 miler I have my eye on. My favorite run right now would have to be the Mt. Hood 50 miler that I ran while I was hiking the Pacific Crest Trail. I had so much fun, worked through some race-day obstacles, and took 20 minutes off my previous 50 mile time, all in a beautiful setting surrounded by awesome people. Ellen: Great choices all around! Western States is undoubtedly the holy grail of ultrarunning! We will keep our fingers cross for you and those lottery tickets as well. And you're right, Mt. Hood is crazy-beautiful and at the top of our rave-run list as well! 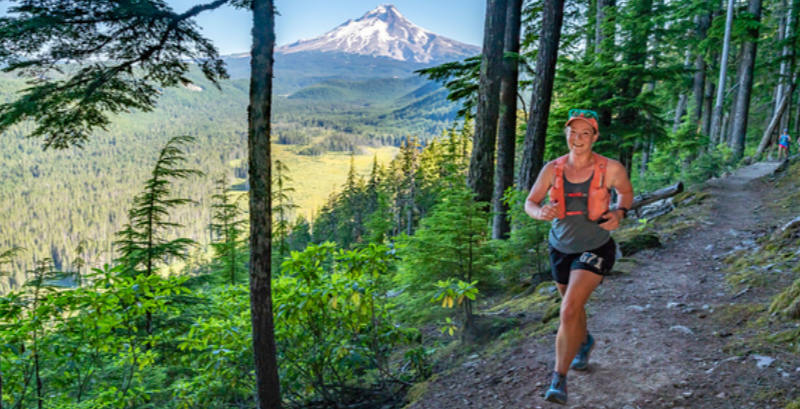 Now that you've completed the Pacific Crest Trail AND run an impressive number of marathons and ultras, what's next for you? Abby: I would like to BQ again, but with a time that actually gets me into the race, and as I mentioned I want to tuck another ticket into that WSER lottery. But also this year I want to try a race ladder: 5k, 10k, 13m, 26.2m each with a "pre test" race then 6 weeks of focused training before racing the distance. Each training and building on the previous. The marathon would get a full 8 weeks. I think that will help me find the benefit in strength training and help me learn to push when I want to pull back. Finding endurance in shorter distances. Ellen: Wow! That's a very well-rounded list of running goals you've got there! We wish you all the best as you chase them, we believe you've got what it takes to crush them all, and we can't wait to follow along via SportTracks! Thanks so much for taking the time to chat with us, Abby! Keep up all that awesome training and know that we'll be cheering for you! Thanks for checking out this post! You can read more about Abby's Pacific Crest Trail adventures in her excellent PCT Journal. In addition to being an accomplished Orthopedic Physician Assistant, Abby McCarthy is a dedicated endurance runner and hiker. She lives in Rochester, NY and is coached by Daven Oskvig.